Children who live in poverty or are homeless face many challenges and tremendous stigmatization.As a result, less than 25 percent graduate from High School.Operation Backpack helps prepare these children for school by giving them a new backpack filled with grade-specific school supplies.A new fully loaded backpack can make the difference between children fitting in and being excited to go to school or refusing to go at all. 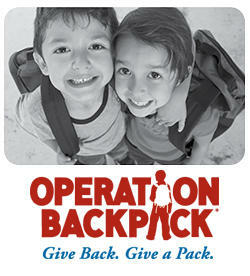 One of the most devastating consequence of living in poverty or experiencing homelessness is the impact it has on a child’s education.Without a backpack and/or the necessary school supplies required by the schools, the first day of school finds them feeling embarrassed and inferior to their classmates.Through Operation Backpack, Volunteers of America is able to provide support for these children. While helping to relive a financial burden is important, it also helps the children look and feel like their peers who are beginning the school year with a brand new backpack and the required supplies. Purchase a new backpack and fill it with fresh, grade-appropriate school supplies. Sponsor a school supply collection between July 1, and August 3, 2018. Bring your new backpacks and/or school supplies to one of the drop-off locations before August 3, 2018.